Join the discussion on our forums! 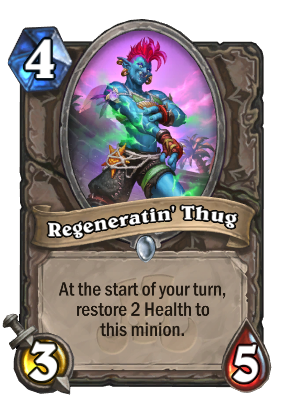 Come discuss Regeneratin' Thug over in our dedicated Regeneratin' Thug discussion topic. Northshire Cleric will love this. Solid arena card.. 3/5 for 4 is will trade favorably most of the time as a 4 drop, and survive to tell the tale. So it adds a lot of pressure for the opponent to clear it due to free "snowball" effect. Arena card, I think. 4 mana 3/5 sounds good and trollish nature will be really useful.